Maudelle Driskell holds the discovered crate top. "For SS St. Paul. Sailing February 13th. American Line. Liverpool. Please forward with dispatch." When poet Robert Frost returned to New Hampshire from England in 1915 he moved his family into a small farmhouse in Franconia. Since 1976, when the town of Franconia purchased the property, The Frost Place has provided a glimpse at the poet's life from a hundred years ago. His old chair sits near his old desk near his old wallpaper. Frost Place Director Maudelle Driskell says volunteer Dee Macoun was emptying the contents of a small closet during a routine clean up when she noticed something unusual about the large slab of wood supporting a shelf. She said that she'd found something and we should come over and take a look. And she just brought it out very matter of factly and we put it on the ground. And it took everyone's breath away. A couple people were brought to tears. And we just looked at it for a second and were like, "What? Can this be?" Driskell flips the old shelf support around. Two aged squares of inkstained cardstock are nailed to the front. That handwriting is pretty unmistakable. One cardstock square is washed away but the other - with its unmistakable handwriting - is clearly legible and Driskell reads it. For SS St. Paul. Sailing February 13th. American Line. Liverpool. Please forward with dispatch." And then on the side there's a wonderful hand kind of carved "R Frost Plymouth NH, USA. Frost biographer Jay Parini suggests this was the lid of a shipping crate that accompanied Robert Frost and his family back from England in 1915. He had a wooden crate that was mainly filled with his notebooks and manuscripts - and books. He collected quite a number of books while in England. So I think that was the basis of his own private library and why it was very important to him. In 1912, Frosts' grandfather died. Frost inherited a bit of money was able to sell the family farm in Derry. Frost himself was drawn to Canada to follow in the footsteps of a friend, but his wife Elinor was eager to live under a thatched roof in England. Parini says they flipped a coin. Robert lost and England it was. I think all of Frost's life could be divided into Before England and After England. Before England, Frost was working as a school teacher in New Hampshire and a part time dairy farmer and raising four children. I mean no one had ever heard of Robert Frost. But almost immediately upon arriving in England, things began to change. So a little tiny London publisher called "David Nutt" accepted his book within two months of Frost’s arrival in England and suddenly Frost was up and running. If a flip of a coin brought the Frosts to England, it was a much more serious matter that sent them home. The First World War had begun and the Frosts were increasingly worried they might be trapped in England, as a letter Frost wrote to his friend, the literary critic Sidney Cox, makes clear. They say the Germans have made the whole Atlantic unsafe. This raises questions for me. 1. Do I dare to go home now? 2. Won't it be more dangerous to go every day we delay? 3. Won't it be impossible to get money across to live on pretty soon? 4. Do I dare to stay? Perhaps you think I am joking. I am never so serious as when I am. With a submarine blockade encircling England, the Frosts decided it was time to go. 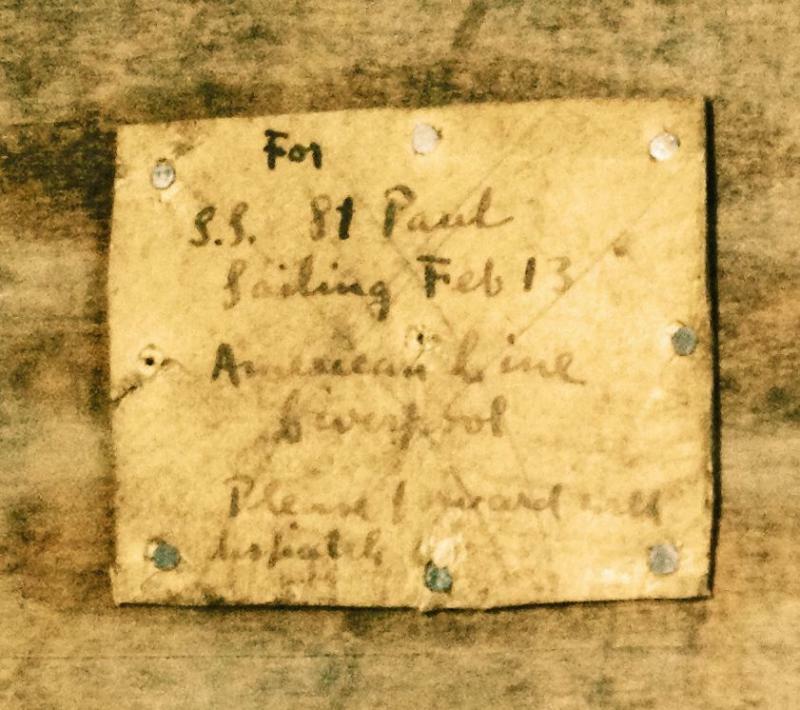 At midnight on February 13th, 1915 they boarded the SS St. Paul for the harrowing journey home. With the portholes blacked out, Parini says the St. Paul was escorted out to sea by two British warships on the lookout for German submarines and mines. And by the time he came back to America, suddenly we're AD - anno domini - and Frost is a major American poet. It's a bit like the shroud of Turin. People love little objects to which they might attach some feeling and significance. But this, in the same way that great art or literature invites you in and brings you to this kind of startling perspective, invites you to imagine him prying open the crate. It places him here in a tangible way. Whose wood this is I think I know.